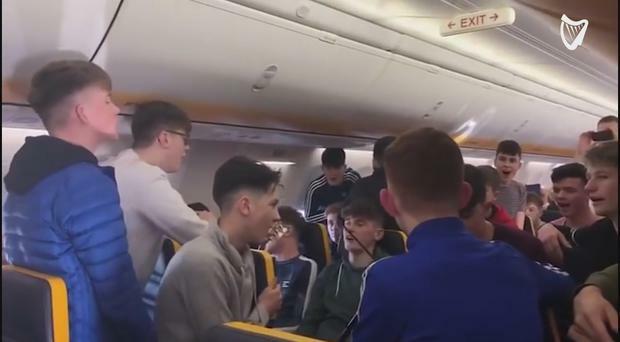 LUCKY passengers got stellar in-flight entertainment thanks to these young musicians who put on a trad performance mid-air. AN IRISH woman's reaction to a great white shark swimming near a popular beach has gone viral. He’s best known for reporting on events in Leinster House on the TV need. WATCH: 'I'm actually mortified' - Does this toddler have the strongest Cork accent you've ever heard? If ever there was a man who appreciates his fans, it's Daniel O'Donnell. A video of two mums lip syncing to their sons playing Fortnite has gone viral. Three sisters from Kerry have garnered almost two million views on Facebook over the weekend for their version of Red is the Rose. Move over Michael Flatley, Jean Butler, and their Riverdance descendants, there's a troupe of grannies with equally jaw-dropping moves. Chart-topper Adele danced around to Beyonce's rocking Coachella set just like the rest of us. There have been many tributes to Dolores O'Riordan in the weeks following her death and this one from the pupils of a Limerick secondary school is particularly beautiful. It was only a matter of time before a member of the media succumbed to the adverse weather in the course of their duties. Dublin seagulls are not exactly known for their friendliness when it comes to interacting with humans. We brought them to Temple Bar Square to give us one last dance of 2017. This airport greeting may be unconventional, but it is very, very funny. You'll never watch Love, Actually the same way again. Have you had enough of the slew of Christmas ads yet? We have not! This is the emotional moment a terminally ill chimp recognises her long-time human friend who came to visit her one last time. If you need to be roused from your Bank Holiday slumber then check out this video - we defy you to resist tapping those toes! Kristian Nairn, who plays Hodor in Game of Thrones, surprised an unsuspecting tour group in Belfast on Wednesday. The death of a family goldfish can often be a traumatic experience but this Snapchat user has done some-Fin different. There wasn't a whole lot of crime fighting to do at the Midsummer's Day with the Stars at Roscommon race course on Sunday. He may have made the leap from 2FM to the rather more serious RTE Radio 1 but Ryan Tubridy still knows how to have the craic. A Kerryman has wowed the crowd at Africa Day in Dublin with his surprise fancy footwork. Des Cahill proved he hasn't lost any of his dancing prowess at the launch of Special Olympics Ireland Collection Day on Tuesday. Three Irish mammies agreed to be filmed smoking weed for the first time and the results are hilarious. In an age where marriage proposals are increasingly elaborate, one Irish man opted for something simple but adorable. A video of Bruce Springsteen inviting an Australian school kid onstage to perform with him has emerged online and it's something quite special. Who better to dish out Valentine's Day advice than those with a wealth of experience behind them? A Tipperary Day Centre for the elderly released a heartwarming video of two gentlemen. Even Barack and Michelle Obama couldn't resist dancing to Michael Jackson's Thriller on Halloween.